* There is a substantial discrepancy -- well outside the margin of error and outcomedeterminative -- between the national exit poll and the popular vote count. * The possible causes of the discrepancy would be random error, a skewed exit poll, or breakdown in the fairness of the voting process and accuracy of the vote count. * Analysis shows that the discrepancy cannot reasonably be accounted for by chance or random error. * Evidence does not support hypotheses that the discrepancy was produced by problems with the exit poll. * Widespread breakdown in the fairness of the voting process and accuracy of the vote count are the most likely explanations for the discrepancy. * In an accurate count of a free and fair election, the strong likelihood is that Kerry would have been the winner of the popular vote. 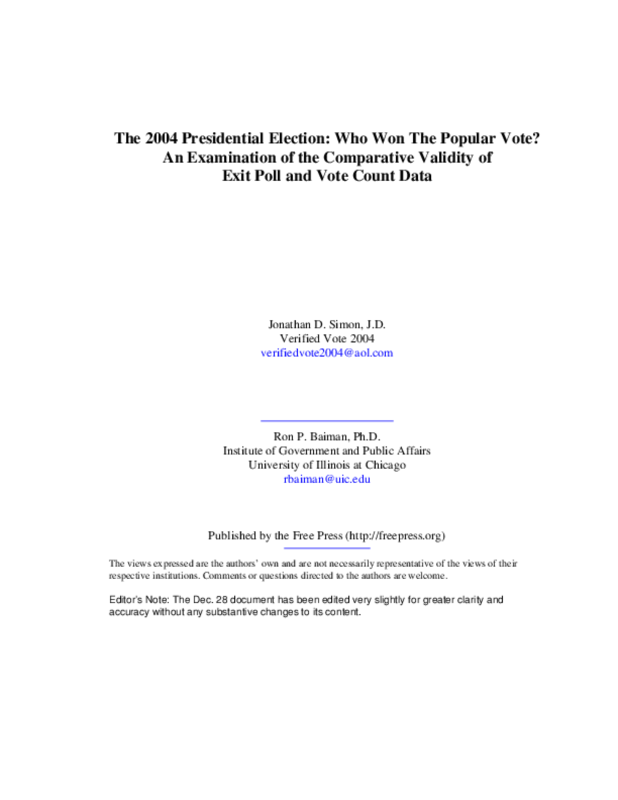 This document was originally published by Verified Vote 2004, and is authored by Jonathan Simon, currently with Election Defense Alliance. Copyright 2005 Election Defense Alliance. All rights reserved.